For as long as I can remember, weddings have been one of my favorite events. 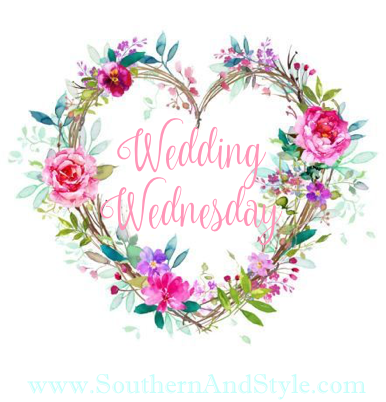 Today I am so excited to begin a series that features beautiful brides from all over so they can share their wedding days along with advice to future brides and inspiration for all of you future brides-to-be! After reading Niki's story and just being able to chat with her through emails (and her answers to these review questions) I can tell she just has the best personality-I think you'll really enjoy this interview! My husband, Josh, and I met on E-Harmony in April of 2015 when we were both 24. 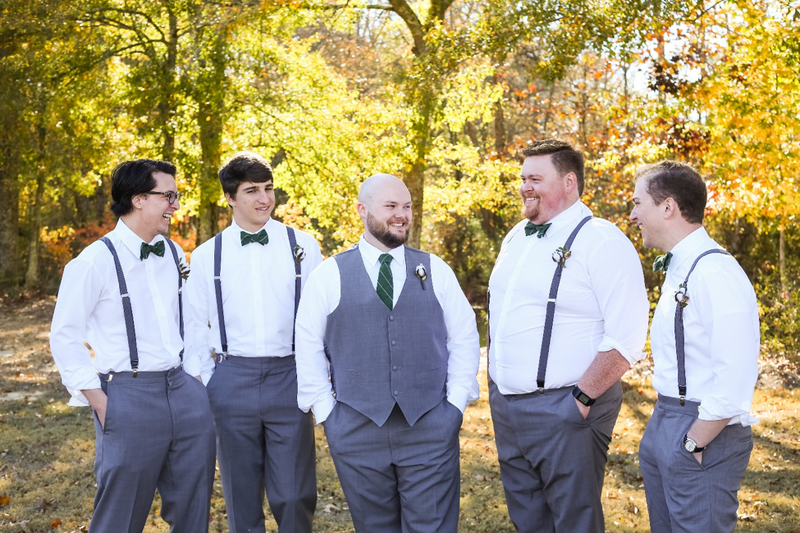 The funny part is we actually went to college together at UAB, years before, where we even lived right down the hall from each other in the dorm Freshman year, were both involved in Greek life, and had many of the same friends (my best friend's long term boyfriend was Josh's fraternity brother). We had met years before, but never knew it! It took E-Harmony to get us together! It's a small world, right? Josh is from Hoover and I am originally from Gadsden, but moved to Birmingham for college. Josh works in Marketing and I'm a nurse at Brookwood Baptist Medical Center. Josh proposed 6 months after our first date on October 2, 2015. When you know, you know right? Josh would probably say, "When she wants something-she gets it." He took me to The Great Pumpkin Patch in Hayden, AL. 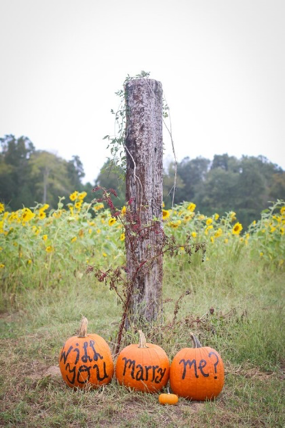 Josh had strategically placed three pumpkins with the phrase, "Will you marry me?" in the center of the patch, along with a small pumpkin with my engagement ring on the stem. A professional photographer (Shannon Layton-Studio 19 in Hayden, AL) and Josh's younger sister Kami Ritchie were hiding in the sunflower field capturing the whole thing! 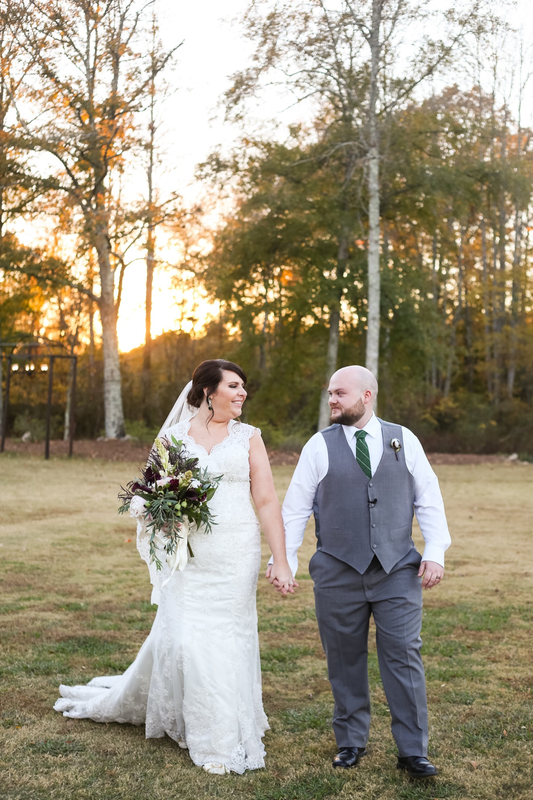 We got married on Saturday, November 19, 2016 at Southwind Plantation in Wellington, AL. I couldn't have asked for a more magical day from the food, dancing, and romance. Josh and I chose to write our own vows which is something that I will hold dear to my heart for the rest of my life. We got married at Southwind Plantation (owned by Ginger and Bobby Watkins) in Wellington, AL. We chose this location because it was absolutely gorgeous and perfectly represented us as a couple. Josh and I also appreciated the history behind the location. The barn was made from trees that were downed during the historically tragic April 27, 2011 tornados. We also got the honor of using church pews that were in the basement of a church that was destroyed on that day. The history and architecture of the venue created the perfect romantic atmosphere for our big day. Not to mention, Ginger and Bobby were more helpful and caring than we could have ever hoped for! This is an easy one! My cake! A year before our wedding I found this ridiculous topsy-turvy cake on Pinterest and was determined to make it mine! The hard part was finding someone willing to take on the challenge of constructing it. Lorraine Smith (Edible Moments by Lorraine in Steele, AL) was the bravest of them all! Not only was the cake special in its appearance, but she allowed us to be super creative with the culinary aspect as well. 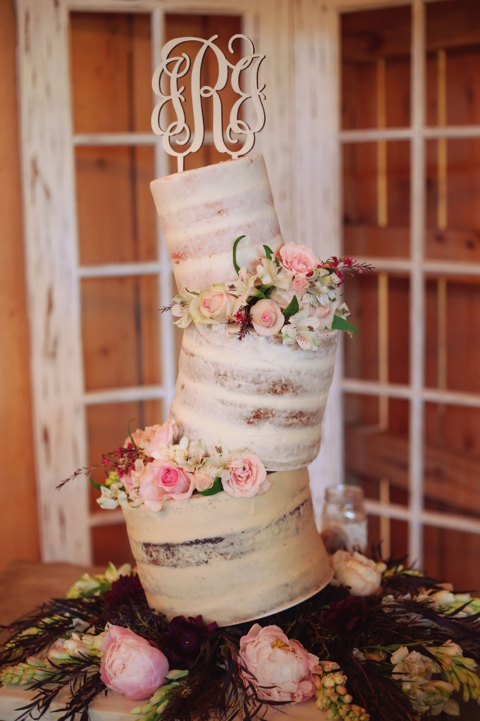 We chose a naked cake with the top tier being strawberry cake with cream cheese icing, the middle tier was carrot cake with cream cheese icing, and finally the bottom tier was chocolate cake with peanut butter icing. She and her sweet husband exceeded my expectations in creating a delicious, unique work of art for our big day! To this day it is still my favorite thing about our reception. 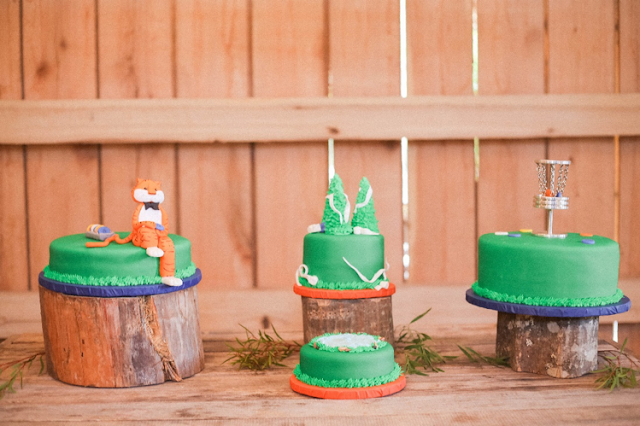 She also made an adorable groom's cake for Josh that embodied his love of Auburn football and disc golf! What advice would you give to other brides as they are planning their weddings? Be yourself! 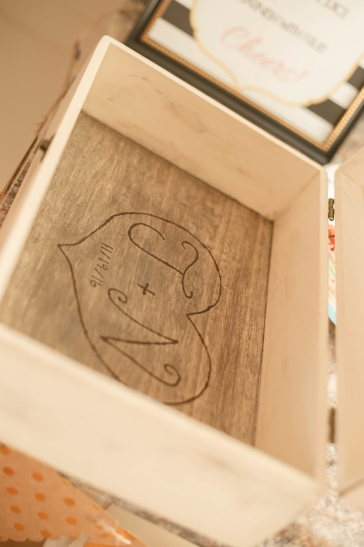 Josh and I choose several very personal touches for our wedding and couldn't be happier that we did. Josh's brother, Chris Ritchie, performed our marriage ceremony. He got ordained just for the occasion and we worked with him to create a completely unique and personal ceremony! We chose to not pay attention to convention or what others would choose, but to make sure we were completely happy. After all, this day is about you...and your groom! There is absolutely nothing I would change! Well, except maybe not wearing a veil since it fell off during the ceremony anyway, but it did make gorgeous pictures! That's a hard one, but if I had to choose it was the wedding day. After all, it's something that every little girl dreams about her whole life. My day was better than I could have ever expected. 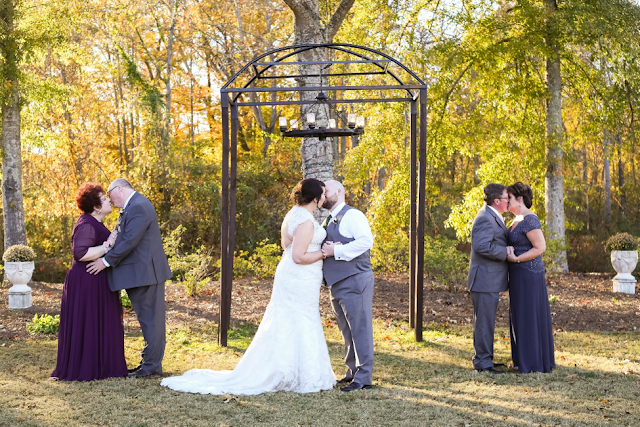 I loved watching all of my planning come together in an amazingly magical way and being able to share that day with all of our family and friends! I also have to thank Shalon Steed of Whirl Events for making sure all of the little pieces fell into place on my big day. Josh and I did a road trip for our honeymoon and, without fail, we had some unexpected adventures! We spent the first night in a romantic Bed & Breakfast (Mayor's Mansion Inn) in Chattanooga, TN. Our plan was to spend the next two nights in Pigeon Forge, TN. Josh and I are both Christmas fanatics so we had reservations at The Christmas Inn! When we arrived in Pigeon Forge the surrounding part of the Smokey Mountains was engulfed in wildfires. We struggled the first night to find activities due to the smoke-filled air. The road to Gatlinburg was closed and the city was already being evacuated. During the middle of the night Pigeon Forge was also evacuated; so having to cut this part of our trip short, we trekked up to Bryson City, NC-a small town where Josh and I had spent a weekend during our first few months together. From there we ventured on to Asheville, NC where we spent three nights and got to enjoy Christmas at The Biltmore! We then spent time in Blowing Rock, NC and exploring Grandfather Mountain. Our final stop was in Sugar Mountain, NC where we spent a romantic two nights in a cabin. As we were leaving to return home, we were rewarded with a gorgeous snowfall! We even started the sweet little tradition of purchasing a Christmas ornament from each location to hang on our first tree as husband and wife! 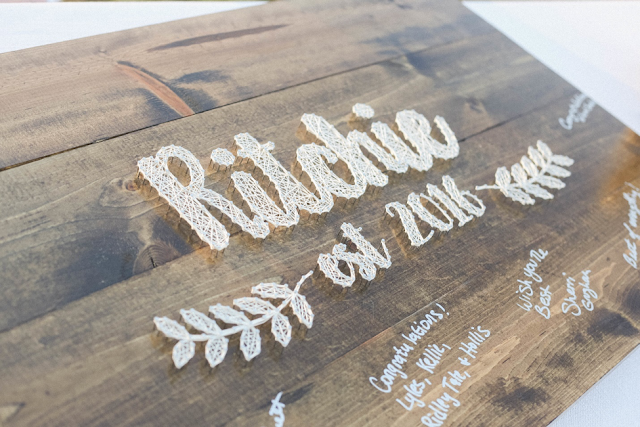 Did you DIY any of your wedding or did you let someone else handle all of the details and why? Josh and I really wanted to do something unique and special for our guests as a wedding favor. Somewhere between my need to be different, my dad's devotion to me, and Josh's love for all things apple butter we landed on making individual 8-ounce jars of apple butter for each guest. As you can imagine, this was one of those times where something seemed to be a great idea at the time, but was really hard to pull off. It took 600 pounds of apples, hours of prepping and peeling, and almost 24 hours of cooking and canning to end up with 144 8-ounce jars, 108 pint jars, and 90 quart jars of homemade apple butter. 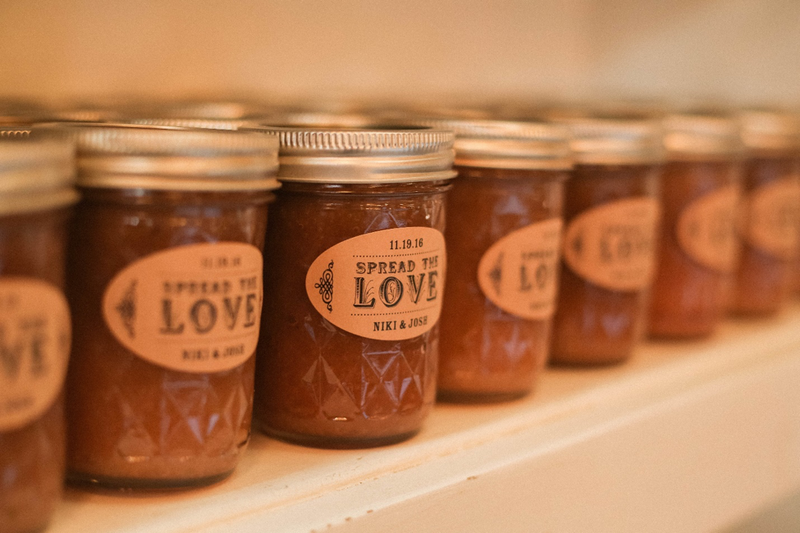 Each jar was finished with a personalized "Spread the Love" sticker. I'm really glad my dad and Josh have an unlimited amount of patience where my happiness is concerned! We gave away the small jars as favors and literally "spread the love" with the bigger jars among our family, vendors, and wedding party to say thank you for all their hard work and dedication! Is any husband super involved with the wedding planning? Just kidding, Josh was as helpful as he could be, especially with the fact that he's color blind! He did build us a beautiful custom corn-hole set for our guests to enjoy on our wedding day. 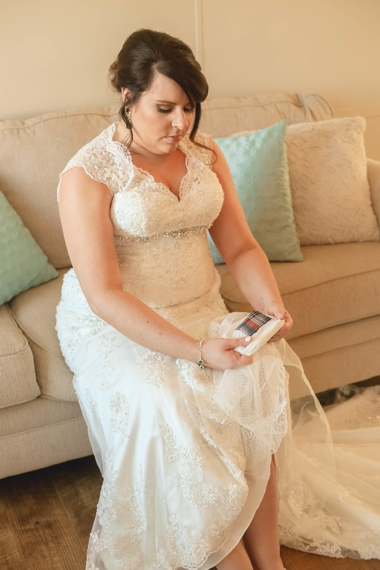 He also provided the most unique part of our wedding ceremony. 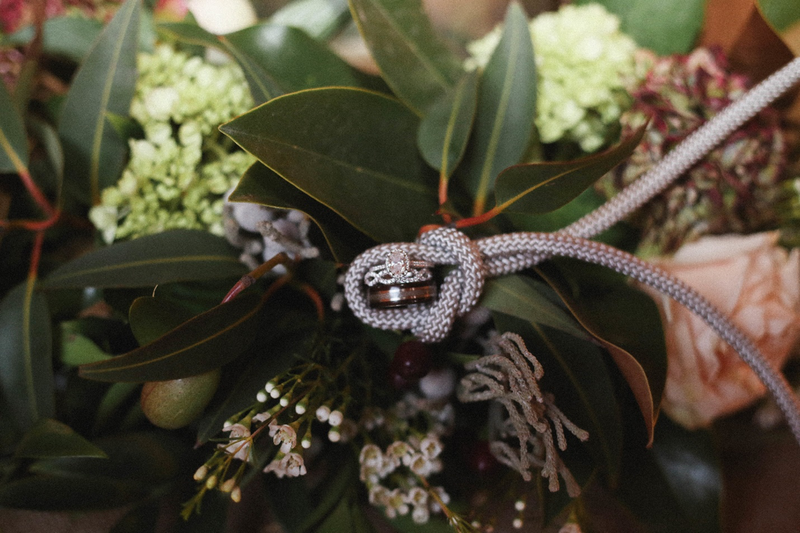 Josh had the idea for us to literally "Tie the Knot" as part of our wedding ceremony. As an Eagle Scout, Josh learned to tie a knot called the sheet bend which lent beautiful symbolism. The sheet bend is used to join together two unlike pieces of rope. Once the knot is tied, the knot will not break, but will only become tighter and stronger as the bond is tested. 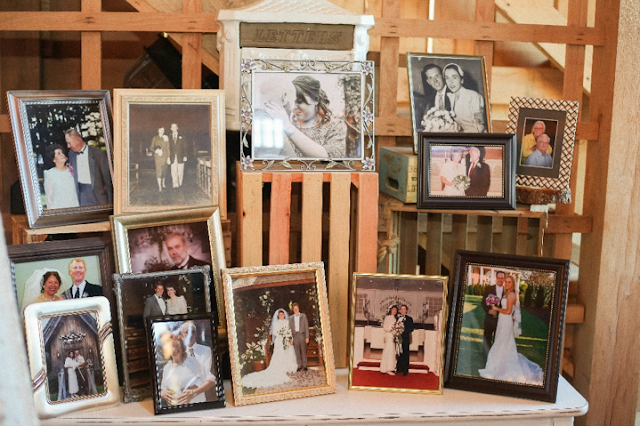 I wanted to incorporate our families into the wedding as much as possible as well as showing parts of our past and remembering those who couldn't be with us on that day! I chose to have two tables at the entrance to the barn. One was a picture of all our family who are no longer with us and the second, my favorite, was a table to show where Josh and I came from. A picture of Josh and I was placed in the center then working outward were wedding/couple pictures of each of our families. It was because of these relationships that Josh and I are here today and how we know how to love unconditionally. I was happy to honor each of these couples. I lost my maternal grandmother and grandfather in 2012 and 2013 respectively. 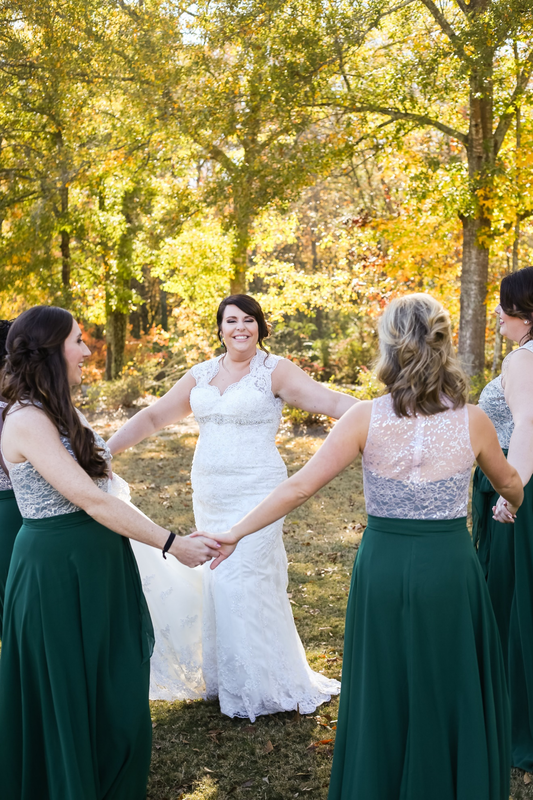 They were two of the most important people in my life and I wanted to ensure that they were with me throughout my wedding day. My something blue was a piece of one of my Paw Paw's shirts. I had it sewn into the inside of my wedding dress. 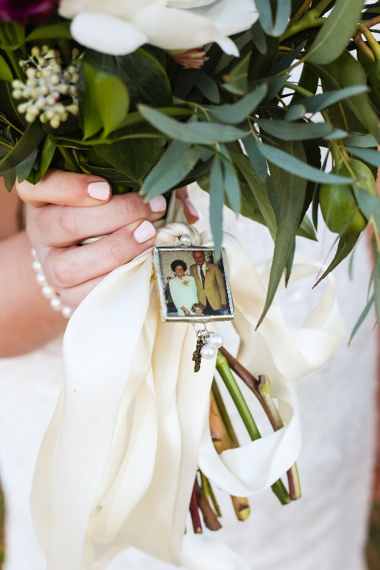 I also had a locket tied to my gorgeous bouquet by Stems and Styles (Suzanne Martenson, Homewood, AL) that incorporated a picture of me with them when I was three years old. I will always cherish these treasures. My mom is my best friend, inspiration, and hero. She and my dad have shown me what real love is and how to have a successful marriage. They had been married 28 years on our wedding day and I wanted to pay tribute to that. 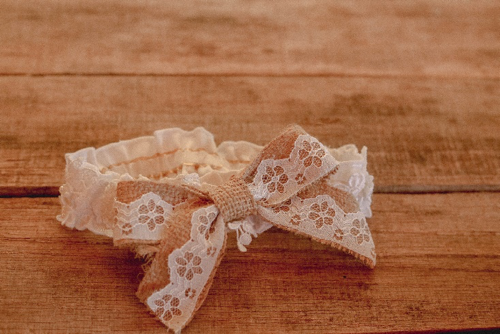 My garter was made from different, carefully selected pieces of my mother's wedding dress. For my wedding gift Josh completely surprised me with an incredibly sweet note and an even more impressive keepsake. 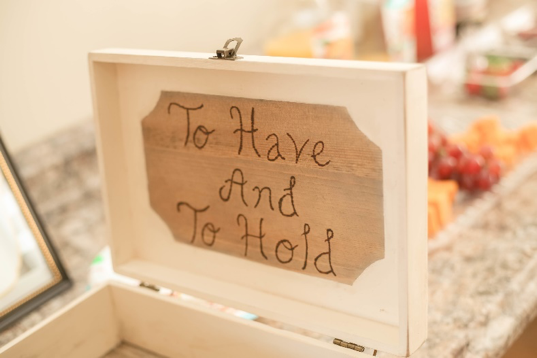 He made me a small box which has our initials wood burned in the bottom and the phrase "To have and to hold" on the inside of the lid. 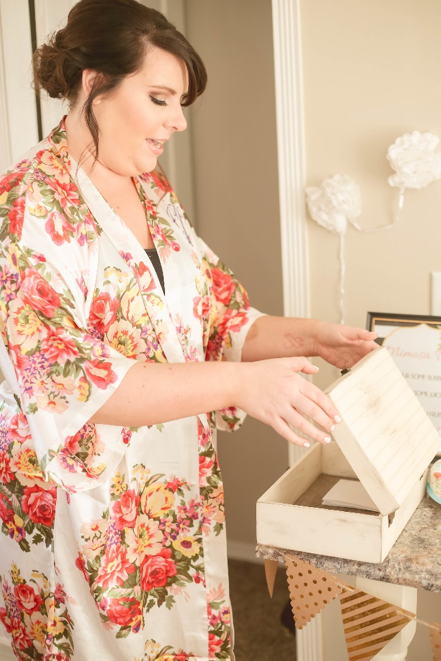 In his note he stated that his box was "to keep my treasures in, pictures of us and our future family, our children's report cards, and everything else that means a lot to us." Y'all, how stunning was this wedding?! 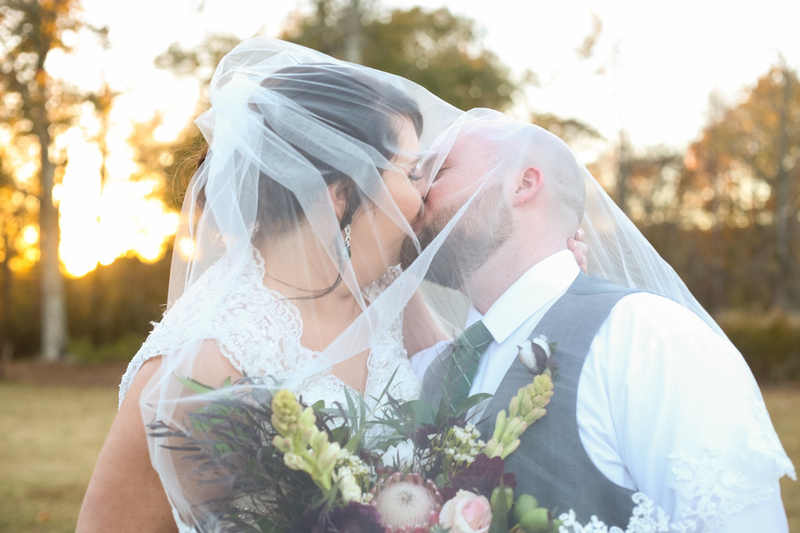 And the stories from how they met, to their wedding favors (she had me cracking up when she talked about the apple butter), to all the special touches, and the crazy honeymoon-every moment sounded like a beautiful adventure! Y'all know how I feel about Amy Sullins-I was also a bride of hers & I highly recommend her!